A Memoir of Injustice (TrinDay, 2011) by Jerry Ray as told to Tamara Carter, with an Afterward by Judge Joe Brown. 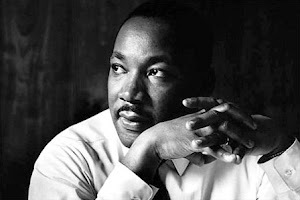 From the moment Martin Luther King, Jr. was shot and killed it was clear there was a war on, not a race war, a perspective encouraged at the time, but because the violence also consumed the lives of John and Robert Kennedy, it was a war over the hearts and minds and political lives of the America people. It is a war that continues today, a violent one that uses murder and assassination as a tool in the chest of strategists who remain behind the scenes and immune from justice, and a war that is manifest in the refusal of the government to release the now historical investigative records of the Congressional investigation into the murder of King. The assassinations of MLK is not unique in the failure of the government to bring Justice to an historic homicide, or release of the relevant government records, as that is also the case with the JFK and RFK assassinations. More specifically in the MLK case, the government failed to put the accused assassin on trial, or to properly identify and locate the shadowy Latin smuggler “Raoul,” who holds the key to the true powers behind the assassination, thus requiring amateur sluths, civilians, historians and the younger brother of the accused to do the job. While there are dozens of other books that go into the details more thoroughly, Jerry Ray’s view of the proceedings is fascinating and reads like a Raymond Chandler novel, without pulling any punches, short, crisp and to the point. The early part of the book, describing the dysfunctional and basically criminal nature of the Ray family, is a sad tale that sets the stage for how Ray could have been easily persuaded to be part of the plot or, like Oswald, set up as the patsy and fall guy. 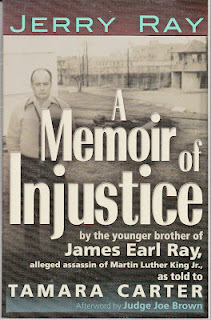 One might expect the brother of the accused to stick up for his kin, even after James Earl Ray died in prison, but Jerry’s story is engaging and believable, and thanks to T. Carter, is delivered in a style that serves a fine example of the proper way to draw out oral history from a closely engaged witness like Jerry Ray. Jerry first learned the authorities were looking for his brother when he heard they were after a suspect named Eric Galt, which he knew was an alias James used. He immediately drove to St. Louis to talk to another brother who owned the Grapevine Tavern, a seedy, shot and beer joint on the hard side of town. From prison, James Earl Ray asked his brother to check out a guy “Randy Rosensen,” whose name was on the back of a car “Raoul” had, a card from the Le Bunny Lounge on Canal Street in New Orleans. She knew a Randolph Robenson, a guy from Florida who came in with a Latin looking guy, good tippers. Though Ray never acknowledged killing King, and it is questionable that his rifle that was left at the scene was the one used in the shooting, Percy Foreman, who became James Earl Ray’s lawyer, convinced Ray to plead guilty to avoid the death sentence, and also avoid a trial during which all the facts in the case would have emerge. Some of those facts would come out during the 1978 House Select Committee on Assassinations (HSCA) investigation and two subsequent civil trials, one led by Dr. William Pepper on behalf of the King family that resulted in the conviction of co-conspirators, thus proving conspiracy. The other case was COPA v. the DOD – the Coalition on Political Assassinations and Department of Defense that sought the release of the military Army Reserves After Action Reports, and though COPA lost the case on appeal, the DOD did release a summary of the reports, which clearly indicated they had maintained a very close surveillance of King and in fact, watched him being murdered. William Pepper once said that he had identified “Raoul” and even talked with him on the phone, but since then, we haven’t heard any more about the shadowy Latin smuggler, or whether the other leads were properly followed and investigated. The records on the Martin L. King assassination of the HSCA are still locked away, and were not included among the JFK Assassinations Records Act as they should have been, though they can and should be released by an act of Congress, if people will only ask them to do so. Justice many never be served in this case, as Jerry Ray concludes, but history still can be, if the relevant government records are released to the public, as they should be. TRINDAY – A few words about the publisher – TrinDay. Millegan has found a nice niche, publishing radical and conspiratorial, though historically documented books that are too hot or controversial for other publishers to handle. Some of the books, like “The Bilderberg Group” by Daniel Estulin and “Shadow Masters” by Daniel Estulin, concern the larger strategic conspiracies behind big governments, big money and maintaining the drug-oil industrial scheme of things that we have no real control over. “The Last Circle” is Cheri Seymour’s story of Danny Casalarso’s fatal investigation into the “Octopus” and Promis software scandal, “Dr. Mary’s Monkey” is Ed Haslam’s personal investigation into the death of a New Orleans cancer researcher, and her ties to those on the edge of the assassination of President Kennedy, which dovetails nicely with Judyth Vary Baker’s Harlequin style love affair with the accused assassin Lee Harvey Oswald. Though there has been some dispute over the details, Baker certainly was employed at the same coffee company at the same time as Oswald, and with few questionable witnesses to them being together, their love life may be exaggerated, but the overall story of what happened in New Orleans in the summer of ’63 is accurate and colorful enough, enlivened by documents, photos and maps that adorn practically every page. Then there’s Hank P. Albarelli Jr.’s “A Terrible Mistake,” about the MK/ULTRA death of CIA officer Dr. Frank Olson, Douglas Valentine’s book on the DEA “The Strength of the Pack,” Lt. Col. Dan Marvin’s “Expendable Elite,” and Peter Janney’s recently released “Mary’s Mosaic” - “Mary Pinchot Meyer & John F. Kennnedy and their vision for World Peace,” that may have a major impact on their both yet unsolved homicides. Janney, the son of a CIA official, ties the murder of Mary Meyer to that of her lover, JFK, and her influence on JFK’s change in thinking about war and peace, best exhibited in the “Peace Speech” at American University on June 10, and a change that led to both their murders. In all, TrinDay continues to give us much to think about, and how those changes should also influence the way we think about politics and murder. Perhaps one could apply the "both parties backed the same theory" to Ray's mini-trial, too. District Attorney Canale and Defense Attorney Foreman were essentially on the same side, with Foreman spending a lot of time on the case pressuring Ray to plead guilty. He spent some of his time with prospective jurors trying to make sure they'd give a 99 year sentence in a case in which they hadn't even heard any evidence; and they would only hear five witnesses. That's not much of a trial. But my blogs are like my home; there are rules. And one of those rules is, if you're name's Len Colby, you ain't comin in. Okay. Back to Bill Kelly's fascinating review. Bill mentions that facts came out during the 1978 Congressional investigation and the civil trials. However, one should not overlook the material developed during the 1974 evidentiary hearing. 1. MacDonnell attacks the FBI version of the crime scene casting doubt on the bathroom as the source of the shot. 2. Dr. Francisco admitted the bathroom couldn't have been the only possible location of the shot. 3. Judson Ghormley described his movements directly after the shot such that he would have seen the killer drive or run away on Main Street had it been someone who followed the actions attributed to Ray. And so on. Much, much more than I have listed here, that basically anihilated the state's case. Writers like Hampton Sides and Gerald Posner ignore all this 1974 material. Critics of the official case should not. MacDonnell was actually there at the window. And his opinion is based on where the end of the rifle---as marked by the dent (which wasn't caused by the rifle, in any event)---would have been and then projecting back the length of the rifle, at the angle it would have to have been for the shooter to have fired the shot. He would have been inside the wall. Ghormley didn't walk. Weisberg and Lesar timed it at the pace he said he used: 45 seconds. Ghormley also didn't have to put a rifle back in a box and gather up all kinds of junk and throw it into a bundle. We are talking about MacDonnell, not Weisberg. See pages 395-396 of Whoring with History. Quoting from the 1974 evidentiary hearing "the spatial relationship of the window and the geometric location of teh windowsill preclude that instrument, at a nominal length of forty-two inches, fitting in the available space with the angle of that mark..." This doesn't refer to the inaccurate drawing in Weisberg's Frame up that has the wrong angle of the alleged shot, but rather from the alleged dent which is midway along the windowsill. Weisberg and MacDonnell had both been to that window. And see pages 93-94 of Whoring with History (Weisberg Archive) for how Weisberg and Lesar re-enacted Ghormley's fast walk. 45 seconds. "Ghormley could not see him because Ray was not there. Neither Ray nor any one else who could have been or who was the assassin." Then there's the FBI lab report negative test on residue on the windowsill for a rifle fired from that location, lack of eyewitnesses, lack of any forensic evidence Ray was ever in the bathroom, etc. Yeah, I have read all the court testimony available at the archive, particularly Jowers, Ghormley, McCraw, Francisco, Ray and MacDonnell. I also cannot access the site at the present time. I have gleaned many insights about Weisberg's investigation from reading his correspondence with Phil Moss, Wayne Chastain and William Pepper about the King-Ray case. Many insights you can't find in documents or books. One person who should have made better use of the 1974 material was William Pepper. I don't believe I've read any discussion by Pepper about why he thinks some of his witnesses changed their stories from what they maintained early. (McCraw, Jowers, as examples). Have you read anything about this. Weisberg pondered this down through the years, as I'm sure you know, particulary with Jowers, whose story he rejected. In another area it was surprising how little he used James Lesar in 1999 civil trial. When he had Lesar on the stand there was more forensic evidence he should have laid before the jury, and especially for those who would later study the trial record. I don't recall that he got into the court proceedings the fact that there is no FBI swab test of the found rifle. They did test the returned rifle, which couldn't be fired. Weisberg was unable to find that record in all his searches. A government official (Shea) verified that. If/when the site is up and running again, do you think you could send me links to those transcripts? It would be greatly appreciated. Re the changing stories, I think Pepper says that Jowers came forward later on because he was sick and wanted to get it all of his chest before he passed on. Which is reasonable if not entirely believable. Not sure about McCraw. If I recall, he suggests that McCraw was scared of Jowers. There was one alleged witness, Betty Spates, who was claiming that Jowers was involved back in 1968. But she changed her story when interviewed by police or FBI. Again, this was put down to either fear or official pressure. I think. The search engine at Weisberg isn't really effective, though better than it used to be. I would check under the "Collections" section; then click on "Civil Actions". In that folder you'll find Ray v. Rose testimony in the Francisco folder (Lesar gets him to admit his autopsy is not only consistent with a shot from the bathroom window), the Jowers folder (they didn't really use him for much except to show Stephens was wasted alot of the time), the McCraw folder (same thing: Stephens was wasted), the McDonnell folder (the forensics guy about being to link the bullet to the rifle and the dent in the windowsill among other things), the Smith, Billy J folder (he was an Inspector---they use him to show how massive the surveillance of Ray was while incarcerated and also the interception of his legal communications). Smith was one of the first witnesses. If you use the search box, type in Wenzler, Robert; you'll find his testimony. It's not in this Civil Action file. He was a surveyor. They use him to try to show the window couldn't have been the only possible firing point. You'll see how inept the questioning was, though. You might also try the search engine for Ghormley, Judson. His is important Ray v. Rose testimony but I don't think it is in that Civil Action folder. He testified just before McCraw. I don't know who testified between Smith and Ghormley. I have over a 200 page gap in the trial record between those two. I don't know where James Earl Ray's testimony is on the Weisberg Archive. I read it on maryferrell.org. The HSCA (see their Volume II) published it. They seem to have ignored everything else from Ray v. Rose since it didn't fit their preconceived effort to get Ray. Ray testified after MacDonnell. I read today a 1975 letter Jim Lesar wrote where he goes through all the questionable things General Haile did to disrupt the efforts of Fensterwald and Lesar to mount the best possible legal assertion of Ray's rights in Ray v. Rose. The site finally seems to be up and running again. I just had a look under civil actions and I couldn't see a Ray V Rose folder. Could you post some links please? I'd be very grateful. Can't give you links til Monday. But let me be clear: there is no Ray v Rose folder. These transcripts are in folders under the witness name. So Dr. Jerry Francisco's testimony is under his last name, Francisco, in that Civil Actions folder. The same for the others---McCraw, McDonnell, and Smith. I found surveyor Robert Wenzler's by using their search box. I can't remember where Judson Ghormley's is; maybe use their search box. Also, there was the testimony of Dr. McCarthy DeMere. Don't know where that is. And Professor Joe Moore and a Chief Hutchison.